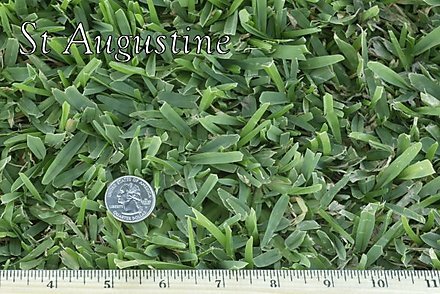 St. Augustine grass is a semi-dwarf grass, giving it a plush appearance. It is less prone to becoming thatchy, even in full sunlight. When mowed high (3" - 4") it is often mistaken for fescue. The leaf blades are tapered at the tip with a rounded end, is course, yet soft to the touch. St. Augustine is the most shade tolerant of all warm-season grasses. It is noted for its exceptional cold tolerance and extended growing season Its deep root system provides superior drought and heat tolerance. The dark-green color and medium-fine blade delivers exceptional uniformity under a wide range of light conditions. It will go dormant in the cooler winter months, and should not be overseeded. It will keep its color better than other St. Augustine grasses and much longer than bermuda.